The origins of this breed lie in the united kingdom and it is believed to be a cross between an Australian terrier and a Yorkshire Terrier. Breed as a dog for small houses, but still capable of rodent hunting. Although his long, fine, glossy coat gives him a rather glamorous appearance - don’t be fooled as this quick smart dog is mindful of his territory. Curious and attentive, the silky terrier is an enthusiastic digger. This docile breed makes a good watchdog and an excellent travelling companion. Silky Terriers are born black, their coats eventually becomes blue & fire red, or blue with tan markings. Despite appearances, with regular grooming they shed little hair. Some health problems that affect the silky terrier are intervertebral disc disease, elbow dysplasia, patellar luxation, legg-Perthes, diabetes, epilepsy and tracheal collapse. 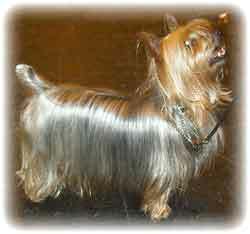 The silky terrier does well living in an flats and apartment, but it has excellent stamina and loves to play outside.